(records) on the computer. At this stage, you can test vertical stacking (i.e., stack limit > 1) if stacking is planned during the actual survey. dx=receiver spacing (see Figure 2 in Product section). occasional markings on the ground by using a spray paint) can be enough to guide the coordinate. Lay out receivers (land streamer) so that the (Nch/2)-th channel can be placed at X = 0 (see Figure 2 in Product section). mode survey, or X1 after the last channel if pull-mode survey). Connect seismic cable and trigger (hammer switch) cable to seismograph. Power on seismograph. Connect laptop computer to seismograph and run acquisition software. 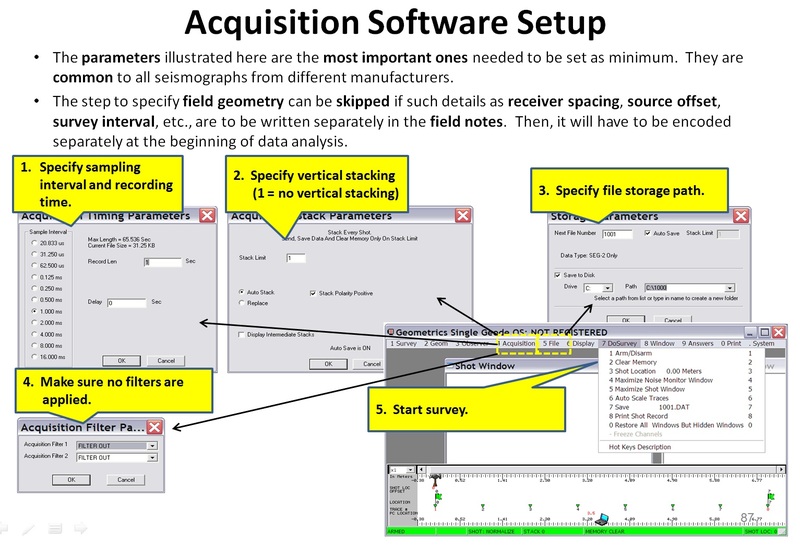 Setup acquisition software (refer to “Acquisition Software Setup”). be deleted (or named differently) and the beginning file name reset (e.g., return to 1001.dat). (number) to be saved. Note in your field notes each time saving a record or whenever an “unusual” event occurs.